A first of its kind on Kloochman Rock, this pure sport route climbs up the 700 foot north arête of Tower 1. The climbing is steep and exposed with generally solid rock. It is in the shade for most of the day, making a great summer time climb. Climbers are rewarded with excellent views of the South Face of the Goose Egg and Rimrock Lake. For gear take 12 quick draws and two 50 or 60 meter ropes. Photo Appetite for Destruction takes the sun/shade line up Tower 1. How to get there Follow Highway 12 west from Yakima. Turn left (south) on the lower Tieton Road, between milepost 168 and 167. After 1.8 miles turn left on the Milk Creek Road. In less than 0.2 mile, take the first right on FS Road #571. Drive 0.4 mile (stay right) until the road makes a sharp bend right and Tower 1 is visible up a prominent drainage. Park off the road. Head up the right side of the drainage directly to the base of Kloochman rock. 20 minutes. Pitch 1 The climbs starts from the lowest point of Kloochman Rock at the northern base of Tower 1. A short pitch past 6 bolts leads to an exposed belay on the crest. Pitch 2 Follow bolts up and right with a few tricky moves. Run-out but easier climbing past one hard-to-find bolt leads to a small ledge and anchor below a roof. Pitch 3 Climb up to and through the well-protected roof then up the nice face above. Pitch 4 Move the belay up to the base of a large detached block with bolts on its right side. Climb the well protected face and arête to a good ledge and anchor. Pitch 5 Climb over a small roof, then up tricky face to a huge ledge with a three bolt anchor. Pitch 6 Scramble up left, then around a pillar to the right, to the final monolithic summit block. Climb up to the top on the west side of the block. 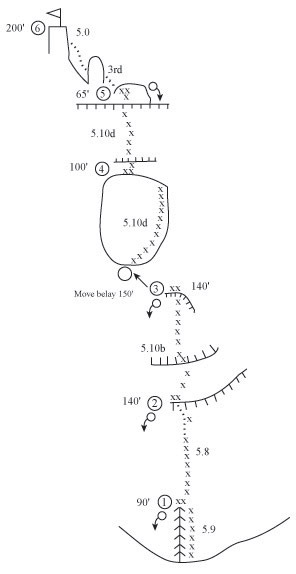 Descent off the 20 foot block requires reversing the same moves. Descent Rappel the route with 2 ropes. 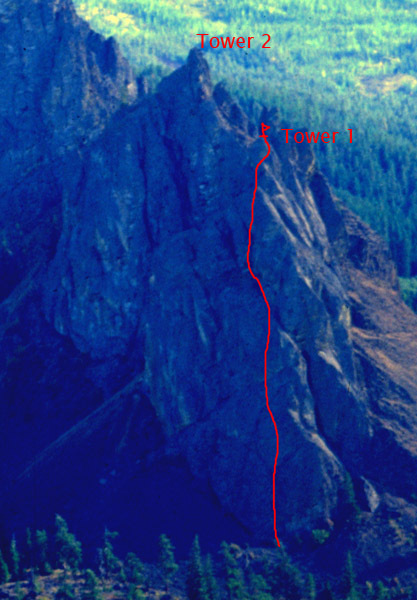 Or down-climb the standard route by traversing a ledge around to the south from the top of pitch 5 to the notch between Tower 1 and Tower 2. Go through the notch (tricky downclimbing) then circle around the west side of the peak and back to the north side. First Ascent Joe Puryear and Stoney Richards, October 12, 2002.